Mike Fitt developed a passion for jazz growing up in London during the Trad-revival of the 1960s. In 1971, Mike and wife Liz moved to Canada, living in Jasper, Vancouver, and Edmonton, where Mike worked at different times managing a family business, working as a bank clerk at CIBC then at HMV, Virgin Megastore and A & B Sound (Edmonton) in sales and purchasing. Through the years, as Mike amassed his formidable jazz record collection, making trips back to the U.K. to scour records shops and auctions, he also wrote detailed discographical notes and assisted with research on the 24-volume The Jazz Discography by Tom Lord, available through subscription as The Jazz Discography Online. The main part of the Fitt Collection of Jazz consists of approximately 12,000 commercially issued phonographs from the 1920’s through 1990’s, with a focus on British Trad-revival and Duke Ellington. Most of the discs are either standard 10” 78RPM or 12” LPs but nearly every other size and speed combination is represented, including instantaneous discs such as test pressings and radio transcriptions. A small number of records in the collection are not slated for cataloguing -- these include genres such as Classical, Pop & sound effects. 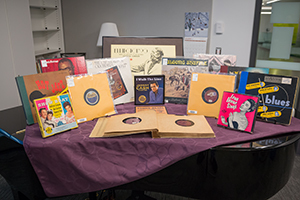 Approximately 600 12” jazz LPs, interfiled in the Fitt Collection, come from the donation of Craig Magill, a well-known Edmonton jazz aficionado and a founding member of the Yardbird Suite. Craig’s collection focuses more on Bop and Contemporary Jazz. Phonographs from Craig’s donation are labeled in acknowledgment of his generosity and are findable in the Fitt Collection database. Test pressings, radio transcriptions, master dubs, acetates, etc. made of lacquer are kept in the MacEwan Archive, while the more stable shellac and vinyl discs are in the main Fitt collection. 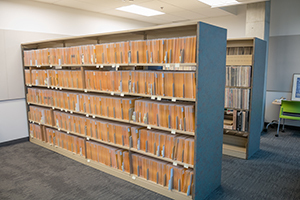 Approximately 3,000 jazz CDs from the Fitt donation were added to the John L. Haar library’s main CD collection and are findable in the library catalogue. There are two boxes of cassette tapes: one of large-label mass market recordings and one of small-label, home-made dubs, and perhaps a few bootlegs. Most of the books selected from the donation were either added to the John L. Haar Library main collection or are in the Fitt collection because they are heavily annotated by Fitt. Several volumes of periodicals such as Storyville, Microgroove and Discographer are there as well. Two boxes of 10” record sleeves were kept for their historical and graphic-design value. The sleeves were removed from the original disc where it was clear the sleeve and label did not match; those that matched were kept with the original. There are several boxes of documents including Mike’s discographical research, conference and festival programs, and personal correspondence pertaining to his acquisitions and research. At this stage, the single-issued 78s and most of the LPs are findable in the Fitt Collection database. Digitally scanned images of the 78rpm disc labels & run-out accompany the 78RPM sides. The other disc formats representing a small portion of the collection will be added to the database in the future. The database can be keyword searched by standard descriptors such as song title, album title, artist, as well as publisher name and issue number and matrix number. A guide to searching the database is forthcoming. Discs with the same size and speed are shelved together. These are further organized alpha-numerically by record label name and number. Identical copies can further be differentiated by the barcode number attached to the outer sleeve of each disc. Since the label numbers are often complex alpha-numeric codes, they are ordered according to a “numbers-before-letters” principle. 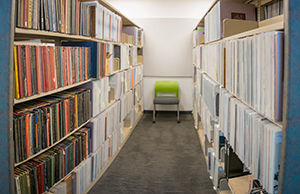 While all MacEwan Music Department faculty and staff have access to the Fitt Collection space in Allard Hall, room 11-323, use of the collection is by appointment only and contingent on availability of the space, which is also frequently used for teaching. If you would like to arrange access to the collection, please email the Librarian, Ron Rooth: ron.rooth@macewan.ca.